1 of 3 Heat oven to 350 degrees . In a bowl, whisk together flour, baking soda and salt. In another bowl, beat butter, sugar and 1/4 cup of the maple syrup for 3 minutes. Beat in egg until just combined. Pour in flour and beat on low until just combined. Stir in oats and raisins. 2 of 3 Drop scant tablespoon-size rounds of batter onto baking sheets, spacing about 2 inches apart. Bake at 350 degrees for 12 to 14 minutes, until golden. Remove to a wire rack to cool completely. 3 of 3 In a bowl, beat confectioners sugar, remaining 3 tbsp maple syrup and 1 tbsp water on low until well combined. 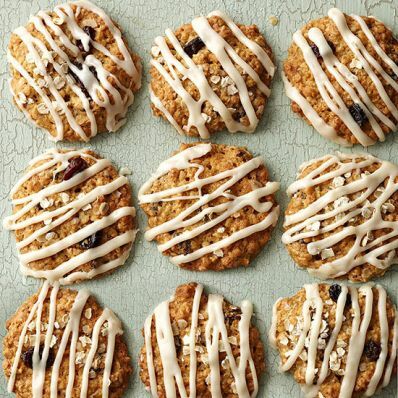 Drizzle with a spoon over cooled cookies.